Tagged under Sunrise (Studio), Series, Drama CD. Whew, I didnt think this anime can be this good. My friend gave it to me like... almost 2 years ago before I started to watch it. It's about heroes in TV. Yup, real heroes with real super power n also real villains. They cought them, they got points n become richer. We can say they look like actors n actress but with different kind of job. They even got some sponsors. The main character is Kotetsu, a middle age man (30+ I think) who loves to help people n doesn't really care about about gaining some points. The other is Barnaby (Kotetsu called him "Bunny"), a young man (24 years old) who has similar power like him. But he is into gaining some points rather than saving people (at first). Both of them, with so many different peronalities, work together as the first hero duo. Partner. Because their sponsor said so. At first, they dont like each other. But time passed n so many things happened, they become real partner. This series I thought was going to be typical but actually it wasn't, I was pleasantly surprised. A TV series in which superheroes are graded and put on TV in their own reality show is very creative. Though the characters are a bit typical, the story line is good and it's really just a funny and interesting series :D My favorite character is Wild Tiger of course~ Veteran hero FTW!! A quiet interesting take on the superhero business. Seriously, A hero TV?? You've got to be kidding. The story plot are easy to guess but the interesting characters made up for it. 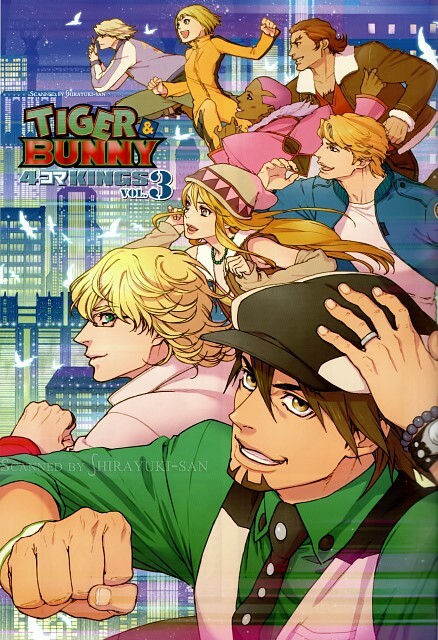 No feedback on Tiger and Bunny.